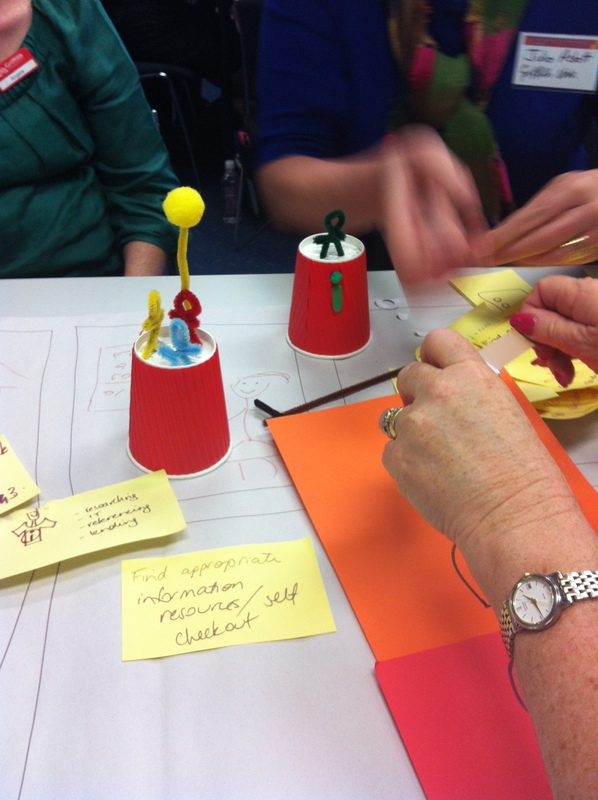 Last Friday I was privileged to deliver an action packed, fun filled design thinking workshop for the Queensland University Libraries Office of Cooperation. 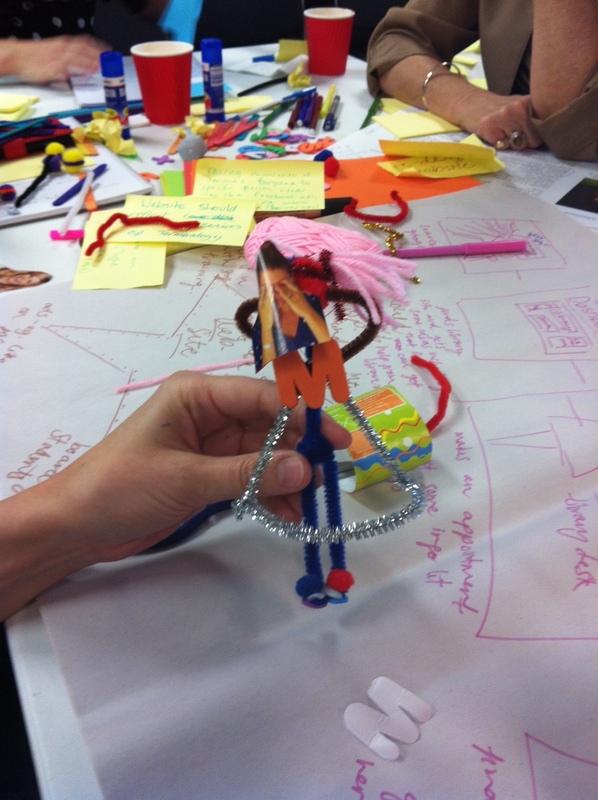 The focus was on introducing people to design thinking principles and providing them with an experience of design thinking. 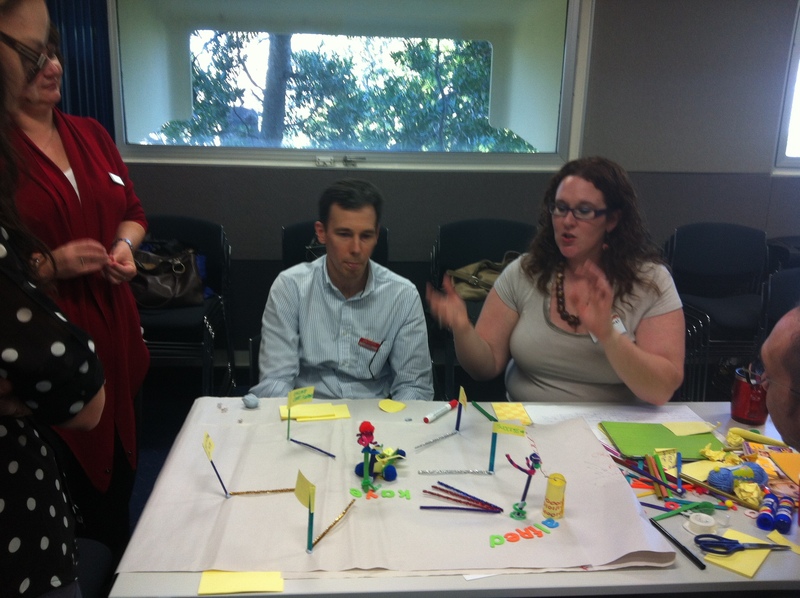 Participants brought real world issues and challenges they are currently facing in their libraries to work on. When synthesised, these challenges grouped into five key areas: providing integrated library and information services; moving teaching and learning online; redesigning the physical library experience; enhancing the online library experience; and raising awareness and marketing of library services. Despite the differences in problems, solutions included many overlaps particularly in creating engaging and valuable 24/7 services that can be accessed online and face to face. In particular the concept of a real and/or virtual library concierge was popular with one group naming theirs ‘Alfred’, also known as ‘R2Help you’. One of the wonderful participants blogged about her experience creating a pop librarian chat called the ‘Light bulb librarian’ in response to creating new responsive services in the online environment. Overall a day of great ideas, great energy and fun with participants taking back ideas and some implementable solutions to their workplaces. Image 1: Meet Meredith, stressed out Masters dress, complete with A line sparkly silver dress. In an episode of the US sitcom Better Off Ted a staff survey revealed low employee morale. To solve this, the director Veronica calls Linda, an employee, into her office and asks what would make the employees happy. Linda says the company treats them all like drones and suggest Veronica let everyone decorate their cubicles to let their workspace feel more personal and individual. The next day Linda arrives at her cubicle to find it’s already been decorated with cats. Veronica explains that upper management believed it too risky to allow employees to decorate their own spaces and so each was decorated for them in one of four inoffensive themes: Green Bay Packers, cats, cars, and space. This unfortunately is not so far fetched from some of our own workplaces where customisation, personalisation and social identity are often suppressed or discouraged. The norm is to assign people a generic workspace of sorts with a desk, PC, chair, small filing cabinet, pinboard and a whiteboard if you’re lucky. 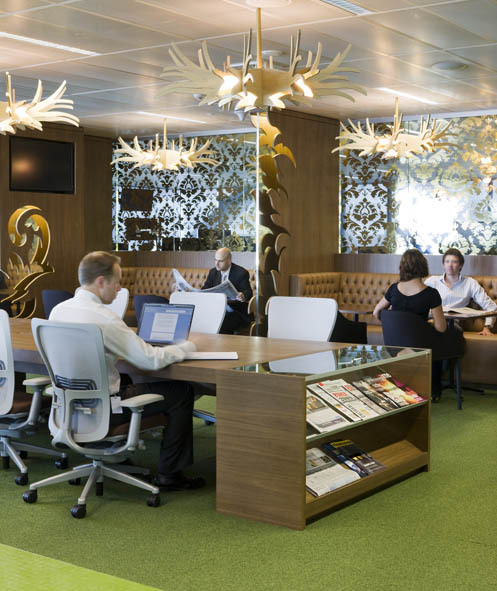 We are all familiar with the Google style of offices – kooky interiors, in house chefs, gym fit outs, dream boy games rooms and the like to encourage creativity, innovation, engagement and collaboration. Closer to real life many workplaces are redecorating with bold colours, a variety of tastefully mismatching furniture and eye catching wall graphics in the hope of envoking a sense of fun and impacting organisational culture and collaboration in a positive manner. These are often architecturally impressive but functionally disappointing. In this new environment, no occupant has an assigned desk: rather the work space provides employees with a variety of settings that allow them to do specific tasks in tailored work settings. This design philosophy encourages increased collaboration and a more productive mode of working. An employee has an anchor point, which is allocated as their ‘home base’ and it is here that their locker and storage resides. The design embraces the changing needs of Macquarie staff (and other users) through the employment of technology (laptops, touch screens, USB ports, WiFi etc.) to enable completely mobile and flexible ‘real time’ work with colleagues. Numerous work zones surround the atrium, designed to house 100 employees each in adaptable neighborhoods…The Main Street on Level 1 offers communal spaces that are highly conducive to corporate and philanthropic events and includes a café and dining areas. Within the office floors ‘Plazas’ were modeled after collaboration typologies—the Dining Room, Garden, Tree House, Playroom, and Coffee House, where cross-pollination among business groups is encouraged through spontaneous encounters. This recognises that people’s work styles are changing and each have differing work preferences and needs – which can differ on any given day and according to the task at hand. Activity based working provides autonomy to employees to work in the space and manner of their choosing. When determining favoured work styles I like to ask the question: how do you work at home? I listen to music, change rooms throughout the day, and my posture will vary from lying on the couch with the laptop on my lap to perching on a bar stool at my breakfast bench to sitting at a regular desk with an OHS style chair. It is in these spaces where I feel comfortable that I am most creative, productive, efficient and happy rather than my more sterile white work pod. Activity based working as demonstrated by Macquarie Bank translates my home experience to some extent into the workplace. It allows people to work where the want, the way they want, according to the work they need to achieve. This era of mass customisation and individualism has not yet invaded the majority of organisations who still attempt to control the space and methods of how people work. People want to be able to create and customise their own workspace according to their preference, mood and need on any given day as much as they vary the music they listen to on their iPods. This requires a large shift in trust in organisations – where proximity to supervisors, clean desks, neat dress and strategy models plastered to pods does not make a good or a happy worker. 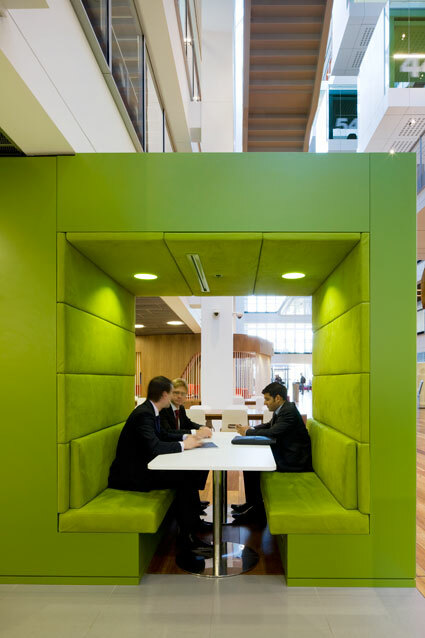 Instead, design workplaces people want to work in, that are conducive to work. Create flexible workspaces where furniture is easily movable and adjustable into a variety of configurations suitable for both individual and collaborative work. If people are familiar and comfortable within their space it assists in inspiring motivation, efficiency, productivity, creativity, innovation…and work. If you have other examples (and preferably an image) of other organisations using activity based working or flexible configurable workspaces I would love to hear about it. What comes first – great leaders or great followers? Sharing by furiousgeorge81. Source: Flickr. echoed many of the sentiments I feel about leadership and ‘followership’ – and what indeed does come first great leaders or great followers (or as Jye calls them supporters)? Can you have one without the other? Maybe the qualities of great leaders and great supporters aren’t so different? By providing a platform of understanding and embrace, you’re doing a large part of what you can to be led, and likewise, a large part of what you can to lead. To be a great leader you also need to be a great follower. This goes beyond the management and leadership debate and instead recognises the value and importance of leadership across all levels, both horizontally and vertically, within an organisation. Follower is an uncomfortable term but implies greater participation than simply supporter. Support can be inactive, where as following implies action and participation. For example I think we all support the efforts of charities such as World Vision, but how many of us donate and/ or become invested and follow the charities activities? Is courageous, honest and credible. From these, you can see that the attributes of a follower are shared with that of a leader and as such through building effective followership skills, leadership capabilities are also fostered. A follower plays an active contributing role whereas a leader leads other individuals in the collaborative effort – however both have shared responsibility for outcomes (differing from accountability which generally falls to the leader rather than the whole team). Mark Hurd, CEO of Hewlett Packard describes this as ‘leadership as a team sport’ – and is based on the concept of shared leadership. This moves beyond organisational hierarchies and creates leaders at all levels throughout the organisation – recognising that succes relies upon individuals, teams, and departments working in collaboration both vertically and horizontally across the organisation. In shared leadership the roles of leader and follower are not mutually exclusive or static roles – nor is one afforded more status or importance than the other. Staff members should be able to flexibly move in and out of leader and follower roles as required. The relationship between the two roles is symbiotic being in one or the other role depends on the situation or organisational need. Shared leadership requires courage at the top of an organisation to relinquish control and flatten heirarchies to allow all organisational leaders (not just managers) to make decisions as appropriate. For me, the strength of a great leader recognises the potential in others and works to bring that to the fore. A great leader enables a great follower. Like the old adage – behind every great man stands a great woman…behind every great leader stands a great follower. Committed, engaged and capable followers, enable great leaders. So what does come first – a great leader or a great follower? Last night I had the privilege of attending Future of Design Thinking: a conversation with IDEO hosted by Design Victoria. The IDEO representatives, Arna Ionescu Domain Co-Lead Connected Health and Jose Colucci Health and Wellness Lead, discussed design thinking and how IDEO implement this within their organisation. This is the first in a yet unknown IDEO/ deisgn thinking series. In Germany they were speaking to an elderly lady with rheumatoid arthritis. They asked her if she could remove the top from her medication bottle. She replied she could. To be sure they asked her again and she replied ‘Yes, it’s easy’. They asked a third time but this time ‘Can you show us how you open the bottle?’. ‘Of course’ she replied. The lady then got up from her chair, took the two gentleman to the kitchen, proceeded to turn on her domestic electric bread slicer (think circular saw, but smaller, embedded into the backsplash) and ‘sliced’ the cap from the bottle. The moral of this story is: being in the natural environment with the end user allowed this conversation to progress to this demonstration, and the realisation of how people complete tasks. Jose Colucci said that if they had’ve been in a focus group situation and she answered yes, they would tick off the check box on the list. She could do it but not the way most people would assume…people don’t do what they say do. IDEO designed the first defibrillator to be used by a lay person and approved by the appropriate authorities. IDEO were able to simplify the process to two steps – turn the machine on and then another button shock the body. However they found users did not like this – and wanted three steps – which is counter intuitive. IDEO introduced a false third step to the process and in testing discovered adding an extra step shaved a few seconds off the time for people to complete the process. Big difference when it comes to bringing someone back to life! As professionals, it’s very easy to develop assumptions about our clients/ users/ customers. This is particularly prevelant the more experience we have with an organisation/ user group/ industry – we believe our experience provides enough knowledge of our clientele…but IDEO show that people do not do what we think they do (or want them to do). Okay…so this one is not and IDEO story, this one is mine…which some of you may have experienced. I have done a number of presentations in my time…and I am an extremely nervous presenter. I often am nauseous for at least a day before the actual event – even if its just a simple short talk, sweaty palms, racing heart, the whole kit! Because I felt like this I assumed that I presented like this also until I had was video taped presenting last year (very scary!). It turns out I turn my super power calm on, I don’t have any odd twitches, nudges, scratching, or stammers. I can even pace myself reasonably well. (I am not a great speaker by any means but I’m definitely not atrocious as I thought!). This is a perfect example of what goes on outside does not match at all the inside – I did not do what I thought I did. From these three statements, it is easy to see how important it is to remove yourself from the process and heavily involve your end users in anything you create. Assumptions are very powerful in the way we conduct ourselves and our work – both our assumptions of the project, as well as personal assumptions of the clients and end users which are easy to go unnoticed, and which they may not realise exist! This is not just a lesson in talking and working with your end users, but knowing them, and teasing out the real solutions to the challenges and issues they face (some of which they may not even know about).